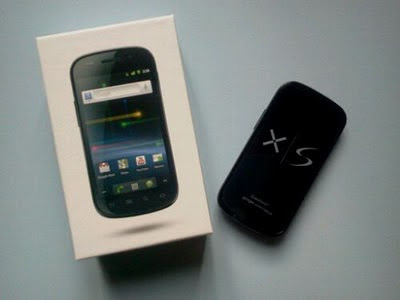 Finally, the Nexus S is in my hands and ready to have some testing. It's the Super Clear LCD version with Android 2.3.3, so I was somehow curious if there is some difference beside the screen. As you can see there is a slight difference, but this seems to be the Android Version. The nromal Nexus S had not 2.3.3 at testing. The hardware makes a solid impression and feels robust in the hand. The specs are all over the Internet, so you just might visit the Wikipedia Google Nexus S site for this. The question that might be most interesting for everyone: How is the display compared to the Super AMOLED? I was skeptic about the SCLCD, which sounds just like a better name to reduce the anger about the phone not having a Super AMOLED. But it's really a much better LCD screen. I have the Samsung Galaxy Tab to compare, which comes with a normal LCD screen. And the SCLCD is brighter, clearer, and colors are brilliant (and real). When comparing to the AMOLED it's definitely more sharp, and more original colors, but that's what some people don't like. So the unreal color of the AMOLED makes it look more impressive, even it's not that clear and sharp. The camera is, unlike the one of the Galaxy Tab, decent and makes good photos for a 5MP phone cam. Battery life is okay, compared to other smartphones in the same class. It feels fast and slick and Gingerbread running smoothly. It's pure Google experience. And that's the only thng I call "real" Android. No other manufacturer GUI on top of it. Just Android like it's meant to be. It might not be a big deal, but the headset in the package is almost offending. The button does not work, no volume control, and a too short cable. You can't start the player with it, nor can you pick up calls. Useless. All in all it's a fine device, even, or just because, the Super Clear LCD. If you want a pure Google phone, that's the one. No dual-core, but we all know, after 1 year, you need another phone. That's soon enough for a dual-core beauty.